The Galilee region in the North of Israel is a land of rolling mountains, olive tree filled valleys, deep wadis cleaving the mountain ridges, and hundreds of small villages scattered throughout. Since I’ve lived here, the government has been widening roads and putting in highways at a dizzying pace. Still, much of this ancient land is pristine, with a rugged wild beauty. Much of it still remote and hard to reach. Perched atop each mountain is a small village. Most of them are tiny Jewish yishuvim, gate guarded communities of anywhere from 40 to 150 homes. 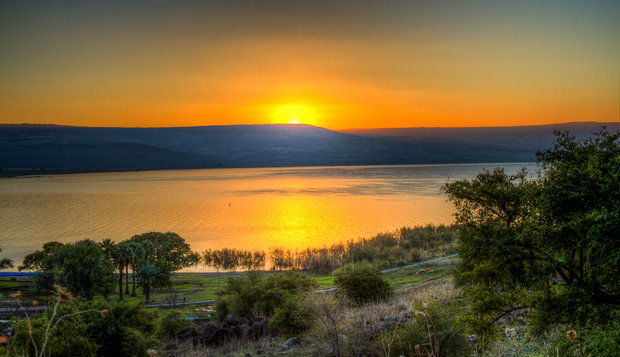 In some , the buyer must apply for residence to keep the neighborhood homogeneous- some are more Orthodox in their keeping of the commandments; others agrarian, each household farming a small plot of land; Amirim is a vegetarian community with a lovely guesthouse overlooking Lake Kinneret (Sea of Galilee); Har Halutz and Hannaton were founded in the 1970s by mostly American Jews from the Conservative movement. They are not kibbutzim, or communal living settlements. Each homeowner remains private and independent. Each yishuv has its own synagogue, community center, kindergarten, parks, a medical clinic, and makolet (a small, independently owned neighborhood convenience store selling basic groceries, hardware, household items) with a do’ar, a post office. The community is tightly knit. There are lots of shared activities… films, lectures, concerts and clubs for the children, as they are usually very family friendly. My husband is a sports coach, traveling between several of the surrounding villages to teach baseball and hockey. At the base of the mountains and scattered throughout the valleys are larger Arab towns- some Christian, some Druze, some Bedouin, most Muslim. There towns are much more densely packed, with fewer green spaces, no set zoning laws, and no parks for their children to play… their choice… and they freely come to our city to use the parks, recreation facilities and malls. So far, we live peaceably side by side. It’s really quite interesting – and for me, somewhat perturbing – that even though I can see many of these villages from my mirpesset (patio), and many of these places are within a mile or two as the crow flies, it takes forever to reach them. There are no direct roads leading from one village to the other. In order to get there, one must travel down through valleys and up winding mountain roads. Bus lines service each community, but still, they seem quite remote. I’ve been here three years now, and finally, in the past few weeks, visited two of them, Rakefet and Yodfat, both visible from my house. Was I in for a treat! At Rakefet, I found a huge garden center/nursery, much like Armstrong’s back in California! We had been looking for a garden center since we got here, usually going to the neighboring Arab village of Madj al Krum or Deir al Assad to the tiny plant stores there. This one had everything we need from compost and organic soil to fertilizer, seeds, tools and the like. We were in gardening paradise ! Just down the road from Rakefet is the tiny little village of Yodfat. Yodfat is a moshav, a community a bit larger and more independent that a yishuv. Another surprise!!! Ancient history, a unique zoo, a goat farm, and modern boutique shopping experience all created the makings of a perfect day in the Galil! Yodfat, population 824, is built on the hill adjacent to ancient archaeological ruins. During the Roman occupation of Israel in the first century, a young general of the Israeli resistance fought off the Roman forces. After an unsuccessful routing in 68 AD, Mattityahu Josephus Flavius was captured after hiding out in the caves of Yodfat. He surrendered to them, proving useful to the Romans as historian (he was schooled in Classical Latin), and made governor of the Galil at Magdala. Some Israelis think of him as the Hebrew version of Benedict Arnold. You can walk around the remnants of the settlement and visit the cave still there today. Yodfat is also home to the Monkey Forest, a popular spot for families and rather unique zoo. There are hundreds of monkeys of different varieties in huge enclosed natural spaces you can walk-through. Stroll beneath the canopy of trees and feed the cute animals who are not at all shy about eating from your hand. They had no qualms at all about hopping up on the shoulders of our madrichah. From there, travel a few yards to Goats With the Wind, an organic, family run farm and dairy. The cattle and goats roam the mountainside grazing happily. There is a film and tour of the cheese production area as well as a restaurant where all sorts of freshly made dairy delights are served. You eat Bedouin style on large pillows set out on the terraces overlooking the valley and sip local wines. But their main shop is now in the village center itself. Yodfat is now one of my favorite places for shopping. Small, but beautiful boutique stores,delis and cafes fill the square at the top of the mountain (visible from my bedroom patio!). There is a lovely shop, Saffloul, that sells handcrafted gifts from nature. Jemma is a home decor shop with beautiful hand printed rugs, pillows, duvets and a lovely array of ceramics, enamelware, and decorative items at reasonable prices. In addition, there was a second hand store; an Italian style deli; a hand knitwear shop specializing in funky socks; and most wonderful general store that sells art supplies, and children’s books and educational (Waldorf) toys!!! I was in heaven! The school at Yodfat is a Waldorf school, I later found out. In addition, there is a bulb outlet in the center…. another hidden gem. Yodfat also seems to be the flower bulb capital of Israel. They produce many unique hybrids of flowering plants, which are shipped worldwide. We bought several varieties of goat and sheep cheese from the Goats With the Wind Store. And then satisfied our ravenous appetite with delicious savory buckwheat crepes filled with wild onions, greens, mushrooms and local cheeses. Local wines were served, and the view of the surrounding countryside back to the city of Karmiel and in the other direction towards Nazareth was spectacular.